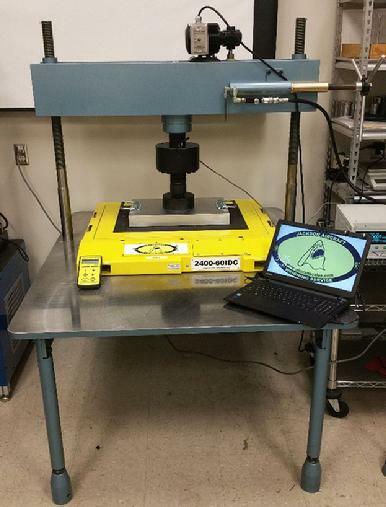 We have now fully tested our Intercomp AN series 60,000 lb platform conversion. Now you can have your older or new Intercomp platforms modified and converted over to our wireless system for easy maintenance and use. We can convert your Intercomp heavy jet system over to our HH2400 series handheld transceiver or to our laptop computer M2400 series with full readout and MAP visual mode pages. You can print a full report from the M2400 series equipment. We are now offering our MAP Visualization pages as shown. Airlines and OEM's demand a better capability for record retention and printing out documents. No more cash register or point of sale print outs! We use your printer, so you never have to buy paper rolls or pesty printer ribbons again. 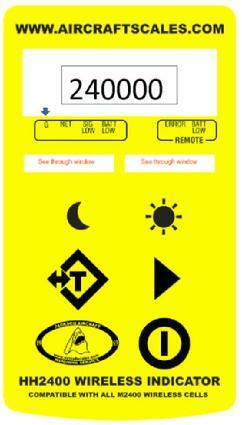 Our HH2400 series hand held wireless indicator. This indicator runs all our wireless system scales, operates on AA batteries that last 1.5 years in service, is portable and easy to use. No more cables or extension cords, just turn it on, wake up the wireless cells and your on your way to weighing your aircraft or helicopter. We are now actively converting older Intercomp aircraft scales. The standard Intercomp scale kit and the digital Intercomp aircraft scale. Our conversions are priced at $3495.00 for our wireless full conversion as shown. Digital load cells are converted to our wireless system, conversion includes a new laptop computer, USB antenna module and converting your old cable system over to our wireless dongle modules. $3495.00 complete with NIST traceable calibration. Three wireless kits start at $6995.00, four cell wireless kits start at $7995.00 and both include a laptop or netbook computer or our wireless HH2400 hand held indicator.! 4 cell wireless kit, all cells are mounted and wireless modules are placed in foam lining for protection. We are currently using Toshiba computers, 15.6 screen standard laptop sets. Each computer is mounted in foam inside you kit and located at the bottom of the case under the wireless modules. Wireless load cell in position on a standard top of jack install. This wireless cell runs on AA batteries making it very portable. Our wireless weighing systems and our new web pages are dedicated to wireless weighing. Our kit is not like the other kits available, we feature a 20 channel range, our indication can be your PC or laptop computer, or our wireless HH2400 hand held wireless indicator, extended range repeaters are available, plus our system runs on standard easily replaced AA batteries or D cell batteries! Our units has been in the field for over 36 months and we have weighed thousands aircraft with the unit. No signal loss potential for giving you a wrong reading, system is self monitoring and will alert you to a loss of signal. Extended battery life plus the system runs off your laptop or the hand held wireless indicator provided with the kit. Our next project is moving into the Windows 8 tablet platform. 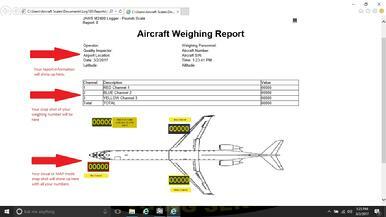 Yes, we will be capable of converting your W8 tablet into an aircraft scale with one simple application.